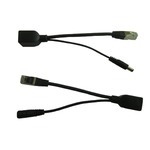 PoE, Wireless & Testers - CBL-PAS-PoE - Only $15.95! Power over Ethernet (PoE) Splitter allows you to connect your IEEE 802.3af-compliant products to a non-PoE LAN switch port. 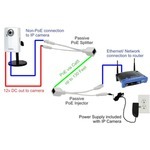 The injector can be used to connect a wireless access point, IP phone, network camera or any IEEE 802.3af powered device (PD) to a switch. No need to run AC power lines for your wireless access point, network camera or IP phone. Simply connect the PoE Injector to the LAN switch port, and use the existing Cat5 cabling to deliver DC power as well as transfer data.